Welcome back for Day 2 of our Spotlight Series on Clint Eastwood! Today we’ll be discussing Mr. Eastwood’s directorial debut: a fascinating, eye-poppingly uncomfortable little thriller called Play Misty For Me (1971). I use the word uncomfortable, not because the acting or directing is poor, but because Jessica Walter (whom you may recognize from Arrested Development) is REALLY good at playing a woman unhinged. Her character, Evelyn Draper, calls to mind Glenn Close cooking rabbits in Fatal Attraction, and even possesses shades of the hapless Barbra Streisand in The Way We Were (guess it’s a good thing K-K-K-Katie wasn’t a p-p-p-psychopath). It’s just…eesh. But, alas, I’m getting ahead of myself. Misty opens with the effortlessly cool Eastwood cruising along a gorgeous, rocky stretch of California coastline. His character, Dave Garver, is a disc jockey for a local jazz radio station (which, by the way, I’d totally believe with a voice like his), where he whisperingly croons poetry and takes on-air calls in between spinning Duke Ellington records. Garver is, in many ways, a typical Eastwood character: wolfishly handsome, aloof, a loner by day and…not a loner by night. He fills his midnight hours with women, and yet he still finds himself pining for one so-called “nice girl” that no amount of recreational love can replace. Shortly after reflecting upon these secret dreams of monogamy, his ex-girlfriend and archetypal One That Got Away, Tobie (Donna Mills), suddenly breezes back into his life– but not before Dave unwittingly becomes involved with a beautiful female fan of his show. Evelyn Draper, the aforementioned craz-o, meets Dave one night (ostensibly by chance) in one of his favorite bars. She’s attractive, he’s attracted, and before you know it they’re stoking a fire and sipping whiskey cocktails at his place. She coyly drops a few hints, and Dave correctly guesses that Evelyn is the woman who has been calling the radio station every night, requesting he play the Errol Garner classic, “Misty”. This is the first in a litany of red flags, but it’s also a perfect example of what Barney Stinson (Neil Patrick Harris) refers to as the “Hot/Crazy Scale” on the show How I Met Your Mother. According to this scale, a woman can be a certain amount of crazy, as long as she is correspondingly hot. Evelyn is pretty hot, so, unfortunately for Dave, she gets away with a lot of seriously questionable behaviors that I suspect she would not have pulled off with slightly less enticing lounging pajamas. From this point onward in the story, things get a bit hairy. Evelyn takes their casual sexcapades to mean that they are now romantically entwined forevermore. Dave, on the other hand, tries to brush Evelyn off in favor of pursuing a real relationship with Tobie, to which, as you might guess, Evelyn does not respond well. She’s been teetering on the precipice of a complete mental breakdown for some time, and when she spies Dave growing googly over Tobie’s icy blue eyes and Carol Brady hair…well, it’s curtains for Tobie, and anyone else who stands in her way. Cue Psycho stabbing music. Here’s the thing about Play Misty For Me. It’s not a great movie–some of the dialogue is a little stilted, the blood isn’t the least bit realistic, and I think the chemistry between Eastwood and Mills as Tobie could have been better–but it IS very suspenseful and well worth your time. It’s obvious that Eastwood has a natural understanding of the camera, and he knows how to set up his shots well. Particularly for a first crack at directing, it’s a really good movie. I’ve seen it multiple times now, and each time I have to watch certain scenes in between my fingers. As I mentioned before, Jessica Walter is downright compelling as the scorned-woman-turned-killer, and it is hard to look away from any scene she is in. There are scares a-plenty, and if you’re looking for a good, eerie slasher flick on a Saturday night, this one’s a great choice (especially if you’re interested in exploring Eastwood’s early career). 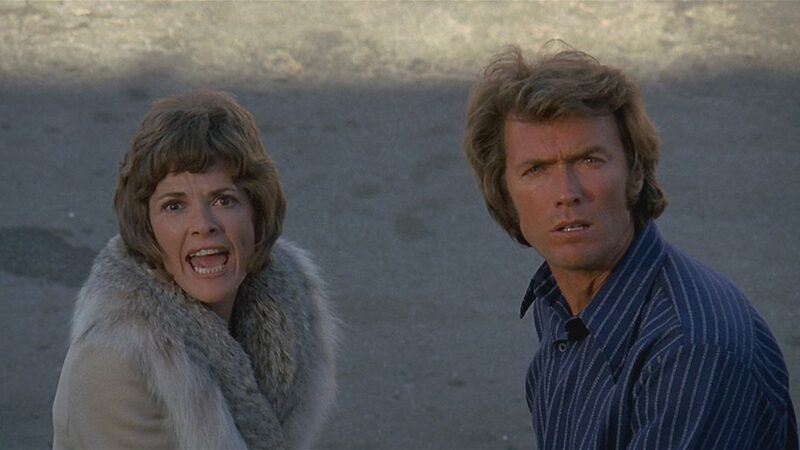 Tomorrow, Charles will be reviewing perhaps Eastwood’s most well-remembered and quotable role, in the film that launched the “rogue cop” genre: Dirty Harry (1971). Be sure to come back and check that one out, as well as the rest of our 7 essential Clint Eastwood movies for this month’s Spotlight Series!